Ciao tutti! Come va? Ha, got you! Sorry, my body is here but my brain is still running on good espresso and the most inspiring catwalks from Milan’s Fashion Week. My dearest readers; so many talented young designers surrounded this Guru! They all reminded me of the far away years of my youth when I was full of dreams, good ideas and stamina. To make my stay more idyllic, I was given as headquarters the beautiful AC Hotel Milano by Marriot. The Guru had the opportunity to enjoy this fantastic hotel together with the ten finalists of REMIX 2017. 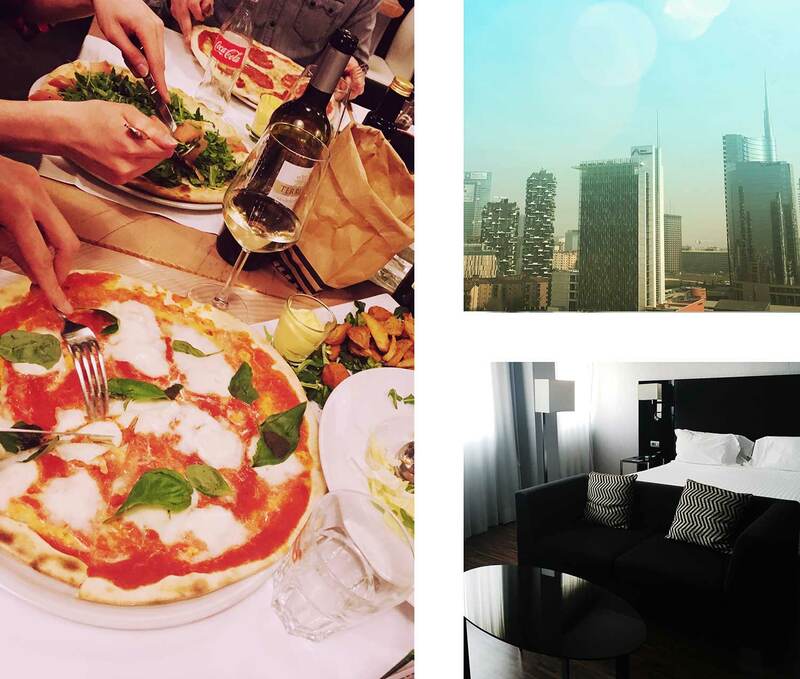 And believe me when I say we did enjoy late night drinks, delicious Italian food and relaxing bubble baths at the end of exciting days around the city in this bit of heaven in the region of Lombardy. Welcome to Milan with a nice pizza/ The Guru’s view from AC Milano Hotel/ Good night sleep at our gorgeous hotel! So, there weren’t that many days that I shared with the finalists but at last, I had the opportunity to meet them in person. Funny I say this because this trip was mainly about that: the people behind the faces, bios, countries they represent and the work they presented. Everything changes when you meet the person, when you sit down and he or she tells you stories about work, family and dreams. It’s true that this was a competition and that there were three winners but, for this federation and me, the ten of them were already front-runners and bundles of talent and dreams to be achieved. We had Yang, from China. He was quiet and gentle but extremely precise with his work and how he wanted to present it. He was also curious and always alert, trying to absorb every single detail of the city and the new people he was meeting. His pieces were an extraordinary mixture of knitwear interweaved almost seamlessly with beaver, Arctic fox and muskrat. Yang is a hand-crafter with extreme attention to detail and accuracy. He takes time to look, understand and enjoy the world that surrounds him. He does the same with the materials he works with. He’s a hand-crafter, an artist and an innovator. Lim arrived early to the hotel from a long flight from Japan. Nevertheless, he still had enough energy to drop his stuff in his room and go out immediately to see the city (Oh youth, divine treasure!). This Korean designer proved to be an independent soul. He doesn’t speak a lot but when he does, the message comes out clear. With Lim, what you see is what you get. It appears to be the same with his design. The power of nature overtook the show with two sparkly owl’s eyes staring at this Guru from the stage. Lim is all about natural vitality and how you can apply it to fur. He delivered with outstanding pieces made out of silver fox, blue fox, mink, rex rabbit and raccoon fur in box pleats. Melisa proved to be the easy going one of the group. For this Latina, nothing seems to be a problem. But please, don’t imagine this made her not interested or not involved (never! She’s Latina, do you remember?). This girl has certainly fire in her belly; she knows what she likes and what she wants for herself and her career. She’s proud (and she should be) of representing women and the strength they embody. All this female power came to the show with beautiful blue fox, grey fox, Argentinian wild fox fur worked with soft leather. Literally, what this Guru would describe as a match made in heaven. For her, the accessories are a must; the most beautiful hats were created by this gifted fashion designer. She’s a stylist by nature and she knows her business when it’s time to show off. No outfit this Argentinian creates could possibly go unnoticed. She knows what Latin American extra flavour is about and she’s not shy when it’s time to put it into practice. Behind the scenes with our camera man Paul/ Detail, Yang Xuesong/ Detail, Aigul Asadullina. Morten Ussing won the Gold Award of this competition but that didn’t make any difference. Talking about down to earth, approachable and friendly. The Fur Guru had so much fun with this Danish talent! 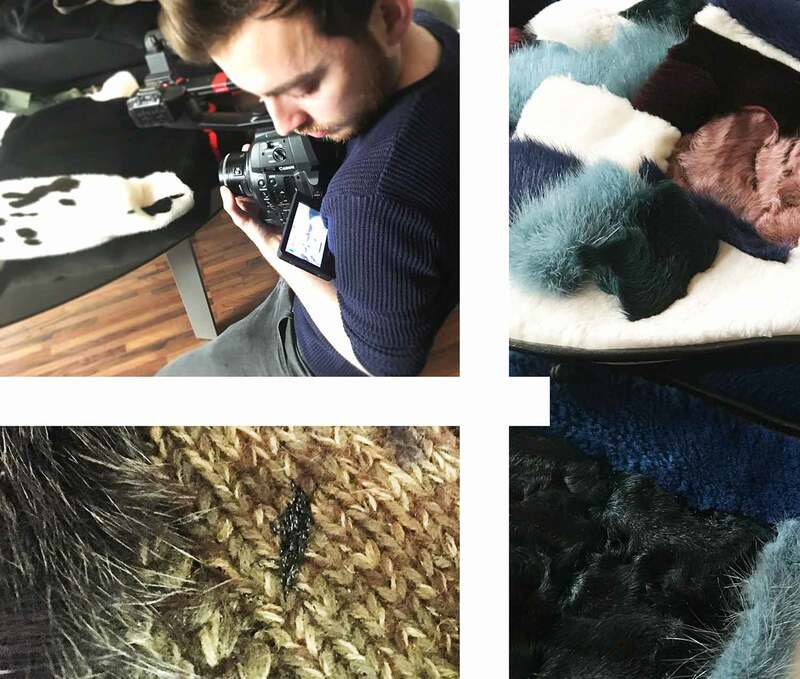 He loves to experiment and while working with his beautiful pieces he tries to learn as much as possible about new technologies and techniques with fur. Morten offers not only gorgeousness but also proposes new paths to approach fur: fusion of Swakara and mink, mink with Finn Raccoon… I could keep going but his imagination seems to have no limits. And that purple and pink skirt, Morten, what are you trying to do to this Guru? A favourite of mine: seal mixed with silk. So yes, undoubtedly, this guy knows how to make a woman happy (and I saw a lot of them smiling when his pieces hit the catwalk). All my admiration and my deepest gratitude for being part (at the end, but still a part) of this amazing journey with you. Maria was reserved but you just need to look at her eyes and see how there’s this magic mechanism working a thousand miles per hour inside her head. She’s quite enigmatic, just like her work. Only a sharp mind can work with Astrakhan fur and lamb as she does. Her infinite shades of black on beaver fur tell all the tales Maria keeps in her head. And even though the outfits of this Ukranian designer reminded us of monastic subjects, there was always an unexpected twist, which made the lines and silhouettes look dynamic and up to date. P.S. The Fur Guru wants to say a big thank you to all the staff from AC Milano by Marriot who made us feel so welcomed and looked after. We all loved your hotel, it’s just fabulous! REMIX 2017 was sponsored by AC Milano Hotel by Marriot.